Bluestone PIM is a SaaS product information management (PIM) solution which offers digital assets management (DAM) features. The solution is ideal for enterprises that pursue an omnichannel strategy and want their product information to be displayed consistent and correct across many channels. The user friendly interface encourages internal collaboration, task sharing, and offers well defined role management. Advanced filters for import and export of product data makes the enrichment process easy and rewarding for the organization. Bluestone PIM is built with the aim of supporting easy integration with other IT systems such as ecommerce, ERP, CMS, Order Management Systems, and more. The development is based on an API-first strategy to ensure easy connectivity. A journey from analog to digital information, and we are only just beginning. Using Bluestone PIM will not only save us hours of working in several platforms and databases, but the quality of the information will go from very poor to very good in an instant! By using PIM as our primary source of product information, all our stakeholders from customers to the authorities will have the latest and correct information at all time. As a company in the start of digitalizing product information, Bluestone PIM has been a good solution with an easy user interface and great customer service. The possibilities feels unlimited and we are only just starting. As a company in the start of digitalizing product information, Bluestone PIM has been a good solution with an easy user interface and great customer service. The possibilities feels unlimited and we are only just starting. With a new software, not all "nice to have" functions is in place, but still being developed. Also some small bugs to fix, but Bluestone react quickly to fixing these things. Is set up to fit our product structure and G2M model, which is often not the case with more standardized Ecommerce solutions. Solution delivery is supported by highly competent people at Bluestone PIM, which was very helpful for us when building an Ecommerce site for the first time. The solution not being plug and play is a two-edged sword, as it gives great flexibility, but also takes a bit more time to launch. Ideally, a few more standard features on the platform would be nice to have in place, so we could have launched a first version of our shop earlier. Great product with infinite flexibility and scalability. The 100% micro service architecture makes this product one of the most versatile products on the market. Easy to use and easy to integrate with. Some of the less important features are not fully covered by external APIs yet. But according to the backlog, it will not take long until we have full access to this to. I have worked with the solution in several projects, and it continues to surprise me positively. The flexibility in the solution is excellent, and it got a great user interface. Their API first philosophy enables us to take advantage of all potential omnichannel options. Not much but I am missing a change log (audit trial). However, I have heard that this will be included in a future release. Their translation module is a bit lacking. It allows for an easier overview of where you have "black holes" in product information. Great filtering functions for drilling down to a selection of products to work on.As Bluestone PIM is a SaaS-product you don't have to install anything. This means easier administration than most other PIM-systems. It is has all the necessary functions that you need to enrich and work smartly with your product categories and catalogs. As Bluestone PIM is a SaaS-product you don't have to install anything. This means easier administration than most other PIM-systems. It is has all the necessary functions that you need to enrich and work smartly with your product categories and catalogs. The system is very configurable, but if you have a lot of special needs with regards to development you may want to look for a more enterprise-oriented PIM - solution. Pricing is dependent on number of users, SKUs and API-calls and SLA. Contact Bluestone PIM for a custom pricing quote. 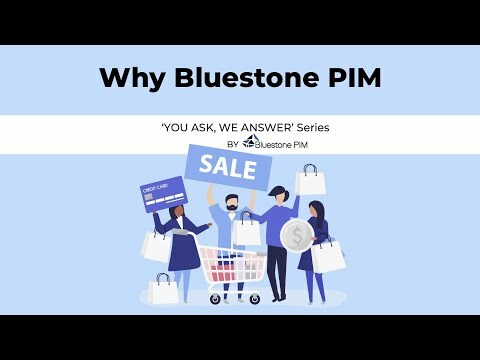 Below are some frequently asked questions for Bluestone PIM. Q. What type of pricing plans does Bluestone PIM offer? Q. Who are the typical users of Bluestone PIM? Q. What languages does Bluestone PIM support? Q. Does Bluestone PIM support mobile devices? Q. Does Bluestone PIM offer an API? No, Bluestone PIM does not have an API available. Q. What other apps does Bluestone PIM integrate with? Q. What level of support does Bluestone PIM offer?